Explanation 103 : We have to consider differentials first. If f = f(x) then df = f '(x) dx ; for example, if f = cos(x) then df = -sin(x) dx ; df is the first order approximation of Δf := f(x+dx) - f(x) (calculate df and Δf in the example, with x = π/2, dx = 0.001). If f = f(x,y) then df = fxdx + fydy ('total differential') ; for example, if f = x/y then df = (1/y)dx -(x/y2)dy ; df is the first order approximation of Δf := f(x+dx,y+dy) - f(x,y). Explanation 104 : Now we have to consider curves on the surface. The image curve has parametrisation x(u1(t),u2(t)), short x(t). The arc length s of x(t) satisfies ds/dt = ||x '(t)|| = ||xu1 du1/dt + xu2 du2/dt|| ; hence it follows that (ds)2 = xu1 du1 . xu1 du1 + 2 xu1 du1 . xu2 du2 + xu2 du2 . xu2 du2. Definition 105 : We define the first fundamental form of the surface by (ds)2 = a1 1 (du1)2 + 2 a1 2 du1 du2 + a2 2 (du2)2, where ai j = xui . xuj. Plane: x(u,v) = (u,v,0). Then (ds)2 = (du)2 + (dv)2 ; this corresponds to the theorem of Pythagoras. 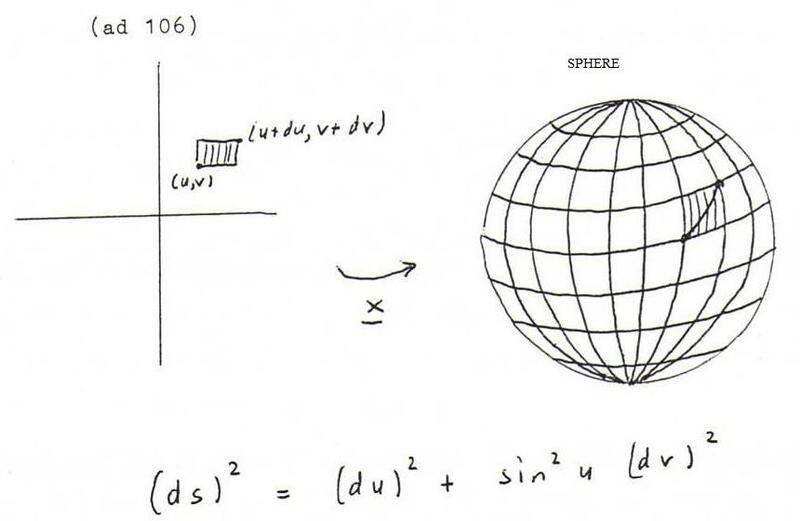 Sphere: x(u,v) = (sin u cos v, sin u sin v, cos u) ; here (ds)2 = (du)2 + sin2u (dv)2 ; see the picture at the end of this section 12. Graph of a function: x(u,v) = (u,v,f(u,v); then (ds)2 = (1+fu2) (du)2 + 2 fufv du dv + (1+fv2) (dv)2. For each surface we have: a1 2 = 0 in the points where the parameter lines are perpendicular to each other. i) The arc length of a curve on the surface, say x(u1(t),u2(t)), t ∈ (t0,t1), is s(t0)∫s(t1) ds = t0∫t1 ds/dt dt = t0∫t1 √(Σ ai j dui/dt duj/dt) dt. = ( a1 1 + a1 2 db2/db1 + a2 1 da2/da1 + a2 2 da2/da1 db2/db1 ) / ( √(a1 1 + 2 a1 2 da2/da1 + a2 2 (da2/da1)2) √(a1 1 + 2 a1 2 db2/db1 + a2 2 (db2/db1)2) ). ∫ ∫ x(G) dσ = ∫ ∫ G || xu1 ⊗ xu2 || du1du2, where the integrand is also equal to √(a1 1 a2 2 - a1 22). So arc length, angle and area are variables we calculate with the help of the coefficients of the first fundamental form and of variables we calculate in the u1,u2-plane ; therefore we call them 'intrinsic variables'. From the following definition and explanation it will become clear why we call them 'invariant under bending' as well. If the surfaces x1(u1,u2) and x2(u1,u2) have the same first fundamental form, we call them bents of each other, and we call the mapping x2 o (x1) -1 an isometry. Explanation 109 : Check by calculation that the right circular cylinder x(u,v) = (cos u, sin u, v) is a bent of the plane (u,v,0); if we shade on a piece of paper a domain and draw two curves on it, and roll up the piece of paper so that it becomes a right circular cylinder, then the area of the shaded domain, the lengths of the curves, and the angle between the curves in the intersection point don't change. Problem 110 : Calculate the angle between the curves (t2 cos(t3), t2 sin(t3), 2t2) and (t3 cos(t2), t3 sin(t2), 2t3) on the surface of revolution (u cos v, u sin v, 2u) in the point with parameter value t=1. Do this in the direct way first, and then with the help of the first fundamental form. Problem 111 : Consider the surface V with parametrisation (u+v, u2+v2, uv). Prove that the points on V where the parameter lines are perpendicular to each other are lying on a parabola. Problem 112 : Calculate the area of the part of the sphere with center (0,0,0) and radius 1 that lies between the parallels of latitude θ = θ1 and θ = θ2 by making use of the first fundamental form. Problem 113 : Show that the right circular cone u(cos v, sin v, 1) (a kind of conical cap) is a bent of a plane (first use for the parametrisation of the plane polar coordinates u and v, and then make some little adaptations).